Teamwork & Team Players Increase Productivity. Many Millennials were raised to support teamwork – everyone works together and everyone wins. Many Baby Boomers struggle with being a team player – they were raised there was only one winner so you better be the best. I’ve been part of many successful teams; some small – some large. So, what can each of us do whenever we are part of a team? Trust – each of us has to be consistently trustworthy. Be confidential, be respectful, be dependable even in the difficult times. Trust with the little projects leads to trust with the larger projects. Empathy – be aware of the feelings of others and let awareness help you build relationships with your team. Slow down, connect, listen, and ask questions. Show your emotions and others will trust you with their emotions. Be a team builder – look for the potential within the project and your team members. Accommodation – listen for other ideas. Let people be who they are. 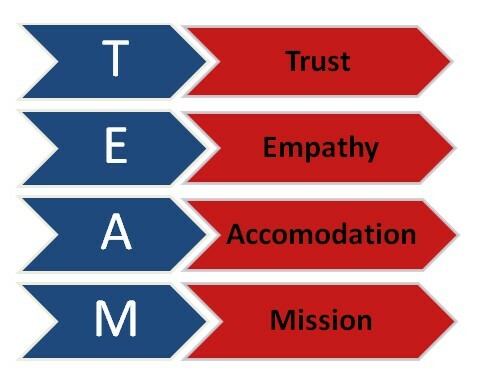 Let the team use each other’s personalities and talents. Nobody is perfect – we all need to be accommodated at some time. During the project your role will shift… especially during periods of transition. Take the lead freely and step aside freely to let someone else shine. Community is where you can be part of the bigger picture. Mission – success is as easy as having one purpose – a shared common goal. Group activities can help but most importantly, the team needs to know what their objectives are. With this information the team can work together to explore and define tactics, timelines and measurements of success. Successful teams magnify the accomplishments of individuals and the organizations. While much of our current workplace emphasize winning and coming out on top – this behaviour demoralizes the creativity of the rest of the team. Fostering teamwork is creating a work culture that values collaboration and shared vision /goals. It doesn’t mean we have to regroup to make every single decision. It does mean we all get to benefit from the ideas and energy of others. If the team is struggling the challenge may be that a common objective and agreed upon tactics haven’t been defined. Don’t always assume it’s each other’s ability to work together. Happy communication and email writing. Give us a call at 416 617 0462. We’ll listen. Click on the image to the right to watch us on Canada AM. www.brucemayhewconsulting.com I’d enjoy reading your comments on this post.